Terrific post by Don Lehman analyzing the recent parts leaks and iPhone 5 rumors. He covers the rationale of the design choices using 4S and Macbook manufacturing insights. I was excited already about the more video friendly 16:9 screen, but this analysis of the rest of the hardware has me even more intrigued. Don makes no mention of the new dock connector having faster data transfer speeds or faster charging, but I’m holding out hope for both. For desktops, Apple has 3 form factors (iMac, Mac Mini, Mac Pro). For Notebooks, it has 5 or 6 (Air 11, Air 13, Retina MacBook Pro, MacBook Pro 13, Macbook Pro 15, etc). The iPod is currently available in 3 sizes. For the iPad and the iPhone, Apple currently has one form factor each. If rumors are true and a taller iPhone and/or an iPad mini are coming in the Fall, that’s pretty big news. Apple will learn a lot about what customers want based on which device they buy, because the existing iPhone and iPad form factors will almost certainly remain in production (the 3GS is 3 years old and still selling strong and you can still buy the iPad 2). Will we start to see people choosing an older model just because it has a smaller or larger form factor? I expect so. It’s not exactly uncharted territory for Apple, but it will be interesting to see how they apply their learnings from other multi-form-factor product lines to the iPhone and the iPad. Will this be a transitionary period or will the iPhone and iPad continue to ship in multiple form factors? Often, while using an iPad or smartphone, I want to multi-task. I don’t mean ‘fast app switching’ or running something in the background, I mean I want to see two applications at one time. That’s not possible with today’s smartphones, so I’ve been experimenting with using two devices at once. 2 screens = 2 apps. In many settings, this kind of experience is easy. 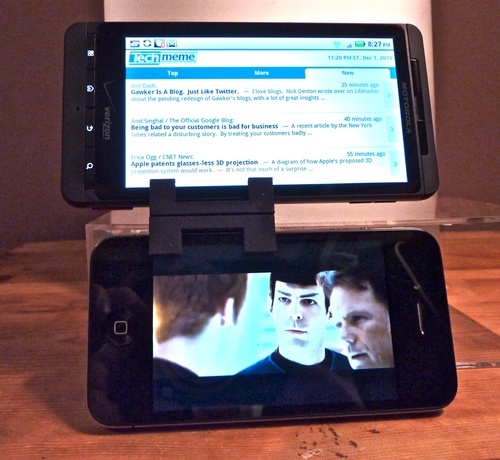 Sitting at a table, you can prop up one device and hold the other in your hands. In other settings, it’s very difficult. On a train, in a comfy chair, in bed, it’s difficult to use 2 smartphones or other multimedia devices simultaneously. To solve that problem, I’ve tried a number of solutions to fix two or more devices together. I’ve focused on non-permanent techniques, since on device is always my phone and I need to be able to carry that alone. Attempt 1: Use Shapelock (a plastic substance that melts and re-hardens easily and can be molded by hand) to create a case that holds two devices. That was not successful at all. The Shapelock is just too hard to coax into the desired shape. Attempt 2: Velcro devices to a metal ruler. This works extremely well. The devices can be rotated to any orientation and the ruler can be bent to put the devices at an angle to one another. Unfortunately, the velcro gets gummy and dirty quickly. Attempt 3: Combine rubber bands, a small clipboard and those grippy dashboard pads to hold multiple devices in place against a plastic plate (the clipboard). Too complicated. I used it twice, but it was difficult to get the devices situated. Attempt 4: 3D printed clips that connect two or more devices. I modelled these in Google SketchUp and had a little trouble getting the fit right. The first batch of these that have the right dimensions to grip my iPhone 4, iPad and Droid X correctly just arrived today. I have several more clips coming from Shapeways over the next week or so. It’s too early to say if this approach will be successful, but there are a lot of reasons to believe it will be. The clips are small – they are pocketable. The clips grip well enough to feel confident that nothing will fall (except for the iPad clip-it needs to be a little tighter) if I’m reasonably careful. The clips are modular. Though I have to order a new clip for each device (each device has a different thickness), they aren’t very expensive. 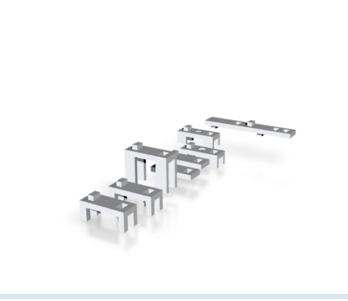 The nature of the clips makes it possible to have extenders or angled connectors to get exactly the orientations you are looking for. In a few weeks, once I have the dimensions cleaned up a bit, I’ll post the final models you can use for printing – at your own risk, of course. If you desperately want the models AS-IS to make your own prints before I’ve had a chance to refine them, let me know in the comments and I’ll send you the files. Below are a few photos. First, the clips themselves, alone. They look like Tron Recognizers… Second, 2 pieces holding an iPhone 4 and iPad together. Third, a Droid X and an iPhone 4. 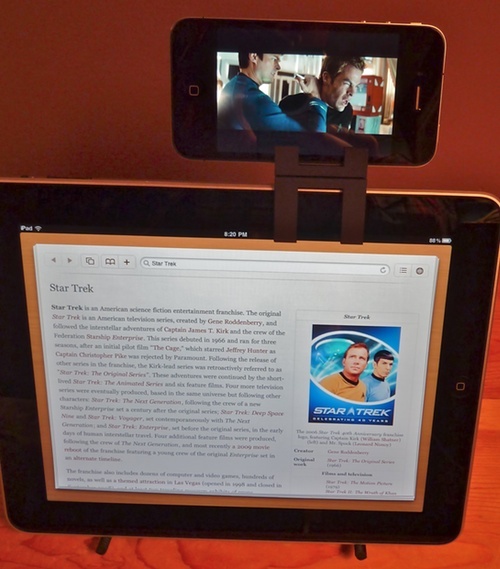 The multitasking shots are a little contrived (researching Star Trek while watching it; reading techmeme while watching a movie). The more likely use cases involve email, feeds (MobileRSS!! ), Twitter, etc. The last picture shows several more clips and adapters that haven’t arrived, yet. I hate phone cases. Over the years, I’ve tried many. It started with PalmOS PDAs, continued with smartphones and on to the iPhone. Cases generally bulk up the phone more than I’d like and the protection offered doesn’t outweigh the reduction in utility and comfort. The small grippy edge on the back of the case lets me rest the phone at an angle on mugs, books, walls – whatever is handy – to get exactly the angle I want for browsing Instapaper or watching video. Without the grippy edge, the iPhone will slide off of anything I lean it against. The slightly raised edges on the back and front of the case protect the screen and back against falls. By minimizing the amount of grippy rubber on the case, the sides of the phone are ALMOST as smooth as the bare metal. There are some issues with the case. It does add a small amount of bulk and it hides the beautiful metal edge of the device. The vibrate switch is slightly harder to access. Not all 3.5mm patch cables and and headphones will fit through the hole in the case. Anything that works with the recessed jack on the original iPhone should work with this case. With the Bumper on, you can’t put the iPhone in a dock. I don’t use a doc, so no biggy for me. 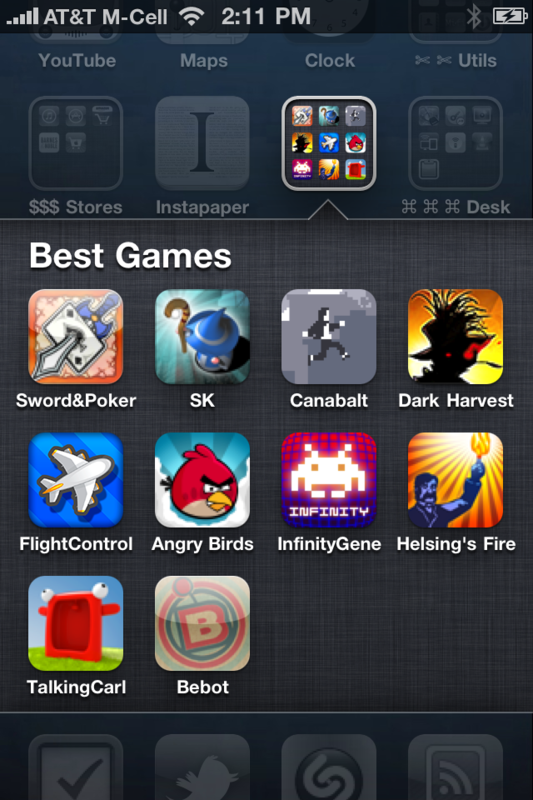 Robert Scoble mentioned that there are some great iPhone games that haven’t been ported to Android, yet. I agree – it’s one of the things that keeps me on the iPhone (along with a number of other categories of high quality apps). Some rapid fire thoughts on the WWDC 2010 product announcements. iOS 4: The Folders feature isn’t great. With the release candidate installed on my phone, it’s very hard to tell two stacks of icons apart from one another, so you have to rely on the tiny text with the name of the folder to tell the difference. Apple should let you choose an icon for your Folder. The design of the iPhone 4 is remarkable. Watch this video to see that all visible metal on the device is either a button or an antenna. Also, the front and back are a new kind of glass that is stronger than most plastic and very flexible. I can’t imagine using FaceTime (video calling) much. I’m not the target for that feature, though. iMovie for iOS (video cutting and editing on the phone) looks great. I expect that it won’t be very responsive, even with the A4 chip, though. We’ll see. I’m jazzed about the faster processor and larger battery. If RAM is limited to 256MB like the iPad, though…. What are they thinking? It’s not enough and will impact the usefullness of multi-tasking. 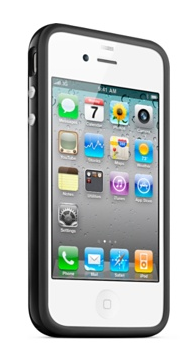 Overall, I’m looking forward to the iPhone 4 release. The A4 chip is blazing fast in the iPad and I’d love to see that speed on my phone. The better screen, front facing camera, gyroscope, 720p video recording, etc wouldn’t have swayed me, though. Battery life, speed and the possibility of better reception were the key announcements for me. I’m not bothered much by the AT&T switch to $25/2GB of Data. It seems very reasonable, especially since an additional 1GB is only $10. I would very much like MIFI-like tethering in iOS. Being able to connect multiple devices for data would be more enticing than single device support. For now, I’ll keep paying for my MIFI rather than depend on iPhone tethering. I’m enjoying the iPad. It’s my primary machine at home, now, unseating my MacBook Pro, in that context, for most things. I don’t use it at all at work, though, since I need a fully equipped computer all day. I am not surprised that many people don’t see a place for an iPad in their lives, yet, but this form factor is here to stay. Here is a quick comparison chart I created in Numbers on the iPad. Sketchbook Pro is the best of the bunch, I think. I looked at Brushes, Sketches 2, Sketchbook Pro, Layers and ArtStudio.